Are you a trained and licensed eyelash extension technician? Do you currently perform eyelash extension services in a salon or for someone else? Whether you currently perform eyelash extension services part time or full time OR whether you are an independent stylist or work under a salon, Eyelashr has the perfect opportunity for you! Eyelashr is an on-demand eyelash extension company that delivers Houston’s top eyelash extension stylists to customers’ doors. This premier eyelash extension service is completely unique to Houston and growing very quickly. Eyelashr is currently seeking the highest quality eyelash extension technicians in Houston to join the team! Clients pay a premium to book their eyelash extensions with Houston’s top eyelash extension technicians. And since you don’t have to spend time on any administrative tasks, you have more time to take appointments. 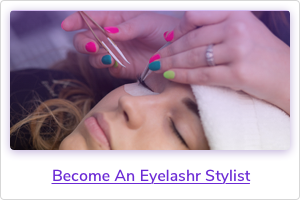 Working with Eyelashr, you’ll earn 2-4 times more than the industry standard. Eyelashr allows its lash technicians to choose their own service locations and create their own schedule, allowing for personal appointments and work elsewhere. With Eyelashr, you can schedule your own availability and take time off for personal appointments by simply plugging them into your personal Google calendar. You will also feel comfortable taking time off for personal vacations by resting assured that your clients are being serviced by the top lash extension stylists in Houston while you are away. Eyelashr lash extension stylists are able to schedule time off for personal appointments and vacations by simply plugging them into their personal Google calendars. That calendar then syncs with the Eyelashr scheduler calendar, which accounts for your time away and travel time to and from your appointments. When your appointments are over, you can make it to your next appointment on time and with ease. Eyelashr offers daily payments for its lash extension stylists. Once you complete an appointment with a lash extension client, Eyelashr processes their payment and pays you a few days after the payment is cleared. Eyelashr rolls out payments daily to its lash technicians, so you always have revenue coming in from your appointments. Eyelashr allows its eyelash extension stylists to choose their home base as their default location and all of the areas in Houston that they want to serve. If you are uncomfortable driving to certain areas or don’t want to travel very far from home, Eyelashr offers you that convenience. If you prefer to service as much of Houston as you can, Eyelashr gives you that opportunity as well. Eyelashr only hires the most qualified, professional eyelash extension technicians. Each stylist is trained, licensed, insured, and extensively vetted. You can rest assured that you are only working alongside the top 5-star lash extension technicians in Houston. If you ever have to be away, or refer a client to another stylist, you can rest assured that your clients will always receive the highest quality service from any of its eyelash technicians. Eyelashr offers a full scheduling platform from its website, so you never have to worry about scheduling your own clients. From your personal Eyelashr profile, you’ll be able to organize all of your appointments and maintain all of your client reports. Eyelashr also offers full administrative support to each of its lash stylists, so you don’t have to take time out of your day to process your own payments or paperwork. Eyelashr offers full marketing and advertising support so that you never have to spend your own time running ads or building your client list. Our lash extension stylists enjoy the benefits of a client list that is built for them with Eyelashr resources. Each eyelash technician also enjoys a fully customized profile on the Eyelashr website that is built specifically to drive business to them. Your personal Google calendar integrates seamlessly with the Eyelashr scheduling calendar. Eyelashr lash technicians can simply input their personal schedule into their own calendar and enjoy the benefits of a personal planner that schedules appointments around their outside obligations, while still including time for travel. Eyelashr also provides customized profiles for each of its lash stylists, specifically designed to drive traffic to those stylists. Instead of spending your own time and money advertising your services and building a client list, let Eyelashr do it for you! Simply take your appointments as they come and encourage all of your customers to schedule their refills with you! If you are a part time eyelash extension stylist currently working out of a salon, Eyelashr gives you the opportunity to perform your quality eyelash extension services without having to use your income in order to rent a booth or space. And since you are able to pick your service locations, you have access to all of the high-end areas of Houston without having to pay extra rent to be in those areas. If you are already an independent stylist who runs a full time eyelash extension operation, you will appreciate the benefits of working as a lash technician with Eyelashr. Working as an independent stylist, you never have to worry about paying rent for a salon space. And since Eyelashr provides your scheduling and administrative support for you, you don’t have to worry about spending hours of your day on administrative tasks and delays. Eyelashr also provides its own customer support specialists for its lash technicians, so you never have to worry about taking time out of your day to answer customer service questions and concerns. Instead, you can you use that extra time earning more money by providing more lash extension services! Since you are able to pick your service locations, you have access to all of the high-end areas of Houston without having to pay extra rent to be in those areas. Each Eyelashr eyelash extension stylist needs to be trained and certified in eyelash extension application. Eyelashr only hires the top eyelash extension technicians in Houston, so you need to have high quality application skills and the utmost professional demeanor. Eyelashr lash stylists must also provide their own massage table and eyelash extension supplies. Before you begin performing any eyelash extensions for Eyelashr, you must also be fully insured. Punctuality & Responsibility: First and foremost, you must arrive on time to your appointment. Compassionate Care: From the moment you arrive and walk into the home, you must demonstrate compassion and care. Uncompromising High Quality Lash Extension Application: Eyelashr offers the peace of mind that any lash stylist will provide top quality lash extensions. Deep understanding of lash extensions, a license to provide the service, education in lash extensions, and hundreds of hours of experience are required in order to perform the demo. We turn down many lash extension stylists who do not perform to our standards during their demonstration. Eyelash Extensions Applied Fast: We know your client’s time is precious. We want our lash extension stylists to be able to apply a minimum of 120 lash extensions on both eyes in 2 hours. Lash Extension Design and Knowledge: With Eyelashr, clients are hiring lash artists that are well-trained and experienced in providing the right look for THEIR eyes and THEIR style. Eyelashr lash extension technicians provide pre application and post application consultations to help our clients maintain amazing eyelash extensions customized to their specific look.